Sennheiser Urbanite review | What Hi-Fi? Headphones have become more flamboyant in recent years. These days it’s not just about the sound, but also the looks. Increasingly, we see headphones not on people’s heads, but around their necks. 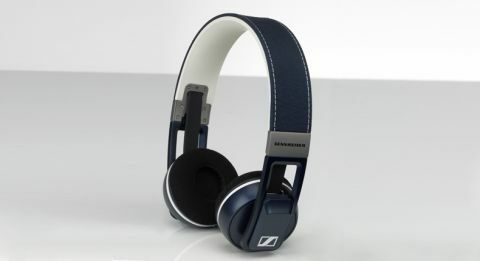 Sennheiser is keenly aware of this – hence the Urbanites, which promise “urban style on the move”. Urban style, in this case, means cool. They’re not harbingers of street cred like the ubiquitous Beats, but you’ll attract occasional looks and possibly garner some kudos from young people. It’s an aggressive departure from the understated elegance of the popular Momentum range. What you get is a chunky metal headband, part of which is covered in fabric and rubbery plastic. The rest of it has a metallic paintjob, which extends to the plastic earcups. These fold inwards for stowing away, while a flat cable fights tangles. Build quality is strong. The paintjob isn’t impervious to scratches, but Sennheiser says you shouldn’t be afraid to “throw them around a little”, and we’re inclined to agree. Just watch out for those chunky hinges, which can pinch and cause spontaneous swearing. Audio-wise, these Sennheisers are equally idiosyncratic. It’s a seriously punchy sound. Whether you’re listening to something bouncy (Shaggy, because we’re feeling nostalgic) or more laidback (alt-J), the performance is a vivacious one. It’s mainly down to the bass, which is somewhat exaggerated. There’s an undeniable emphasis on the low end, where there’s plenty of weight. It’s well defined: listen to anything from Lorde and the sparse basslines are taut and muscular, not flabby. This definition means the sound is clear, and there’s a decent amount of detail on hand, but we wouldn’t go so far as to call it natural. The powerful bass doesn’t drown out the rest of the frequencies, but the midrange isn’t as open and expressive as we’d like. We go back to Lorde and put aside those thumping beats: vocals are less detailed, less subtle and altogether less direct than on the Philips Fidelio M1MKIIs. The Philips’s leaner and more agile sound also guarantees greater rhythmic precision than the Sennheisers. It’s another good pair of headphones from Sennheiser, but these aren’t for audio purists. If you want refinement, subtlety and balance, you’re better off with the Philips Fidelio M1MKIIs. But if you’re all about the style and you like your tunes pumping, these will get the job done.